Donations change and save lives. They feed the hungry, treat the sick and educate the child. It’s for this reason Ummah Welfare Trust runs a 100% donations policy. costs. Whether £1 or £100 therefore, every little helps! Like any organisation Ummah Welfare Trust has administration costs and overheads to meet. Funds to compensate full-time staff, pay utility bills and rents, cover accounting and legal costs, and fundraise, are all needed to help the charity function. How does Ummah Welfare Trust then cover its administration costs while adhering to a 100% donations policy? 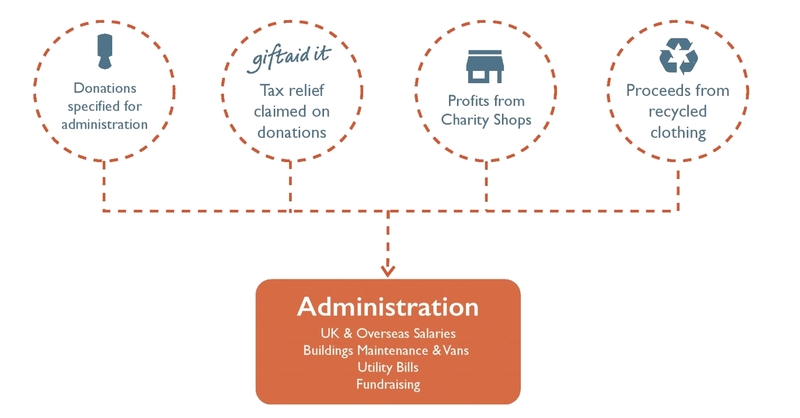 The charity runs a separate ‘administration-only’ bank account. This account has its own sources of funding as detailed below. £1 MILLION BACK INTO CHARITY! Ummah Welfare Trust continues to transfer administration funds back into charity. Alhamdulillah, in the past year, an extra £1 million has been transferred into the charity account, ensuring that even more of our brothers and sisters have been helped.